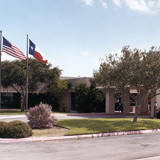 CHRISTUS Spohn Hospital Kleberg resides in the heart of a town known for its ranching history and rich Texas culture: Kingsville, Texas. Licensed for 100 beds, the hospital is a general acute-care facility offering complete medical and surgical services including pediatrics, obstetrics and skilled nursing, as well as emergency, intensive care, cardiac and comprehensive diagnostic services. The emergency department is designated as a Level IV trauma center. CHRISTUS Spohn Kleberg Health Plaza now houses the hospital's birthing services with modern, state-of-the-art labor, delivery, recovery and postpartum rooms (LDRPs); a nursery; the Cissy Horlock Taub Women's Center, a diagnostic and educational/resource center; and physician office suites.